Good shoes illustrate style and attention to detail. When buying, think of them as an investment. It’s a false economy to buy cheap. 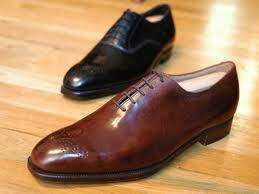 Use shoe trees to maintain their shape. With a new pair, let the polish soak into the leather for 24 hours before buffing the leather. Never store your shoes near a source of heat. The leather may dry and split. Have you brushed your teeth? Have you polished your shoes? Two questions I’d often hear before heading to school. At the time you don’t fully understand the benefit, but thanks to my parents making sure I brushed my teeth before going to school and to bed, I have teeth that have been fairly good to me. If you look after them, they last. The same with shoes. Shoes are very important for two reasons: Comfort and style. Sometimes comfort is sacrificed for style, and the worst stories are those of women who go to ridiculous lengths through surgery to reduce the width of their feet to fit into a pair of “beautiful shoes”. Quite extraordinary. Guys also have their own wrestle with comfort verses style, but thankfully it’s usually only temporary and without surgery! I speak of course of the agony we can go through when breaking in a new pair of leather soled shoes. I liken it to taming a wild horse. Once you’ve broken them in, they seem to understand who’s boss. It goes without saying that shoes are incredibly important. For some, they come as a necessity and after thought. For those in the know, they show a sense of style and attention to detail. Our feet have two opportunities to speak volumes about us. There is the shoe, and there is the way we look after the shoe. Boots and shoes should always be kept in their trees. They not only help regain the shape of the shoe, but also help to minimise the creases you might have picked up in the leather. Always use a shoe horn. Again, it will help to keep your shoes in the perfect shape. Not only is polishing your shoes important for aesthetic reasons but like skin, leather needs to be fed. Polish stops leather drying out and cracking – something that you can also avoid my storing your shoes away from the radiator at home. (I’ve been there). Before you start, give the shoes a quick brush to remove any dust or dirt. If not black, choose a polish that is a little lighter than the colour of your shoes to preserve the original shade. With a new pair especially, there is no harm in applying polish and leaving it over night to really soak into the leather. In any case, there is no lasting benefit to applying polish only to brush it all off in a matter of two minutes. With a cotton cloth, apply polish in a circular rubbing motion to the leather, paying particular attention to the creases. If you have any old cotton shirts that have had their day, these are perfect for this. Now buff like you’ve never buffed before! If you haven’t already got one, invest in a good brush. You can pick up a reasonable one from your local cobbler for between £10 and £20. Horse hair comes recommended. If you’re after a tip top shine on the toe, continue to apply a very thin layer of polish with a lint free cotton cloth, combined with a little spit. Yes, it’s spit and polish time! Again in a circular rubbing motion, within 10 minutes you might just start to make out your reflection in the leather. They are very smart, but you have to be smart with the way you look after them. Stain prevention is always better than cure. This is a painful truth if you are at the stage when you’re looking for a cure! Prevention comes in the form of protective spray that will help protect against water damage and other such stains. Please make sure you spray and protect the moment your new suede shoes leave their box. Also, think ‘damage limitation’. Heading for a boozy night out? Be sensible. It might not be the night to be wearing them. If your shoes are wet, firstly dry them with a towel or kitchen roll, then make sure you let them dry naturally. Don’t scrub them, dab them; and don’t try and speed the process up by putting them near or on a heat source. If you have suede shoes you also need a suede eraser and brush. The eraser should be used to gently and repeatedly stroke the stain. The brush, which typically has brass bristles, should then be used to raise the suede fibres again. A tip for removing oil stains is to rub talcum powder or maize flower directly on the spot. After several hours, brush off the powder. Repeat if necessary. Two things: Put balls of newspaper into your shoes and leave them to dry naturally, away from heat. Not wishing to state the obvious, but wash your feet. Purchase an odour crunching inner sole. You’ll find them in Boots. If you have a cat, or even if you don’t have a cat, try cat litter. If you add it to the shoes before you go to bed and empty it in the morning, it will do its best to eat up odour and moisture. Good tip. If that doesn’t work, then try having your insoles replaced. If that doesn’t work, contact your vicar. It’s time for an exorcism. Excellent – will give suggestions a go later on! Added a bit on suede in the article. Hope it helps! I have put a new pair of shoe horns on my shopping list! My new red suede loafers seem to have picked up a speck or two of what looks like some oily substance on them. How do you suggest I best remove this stain without damaging them?